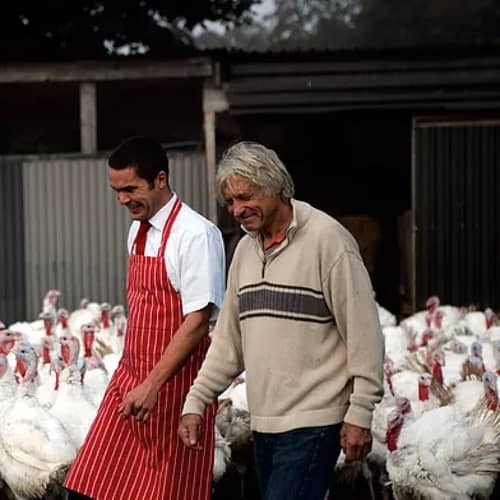 Our turkeys are old-fashioned breeds, produced the old fashioned way! Slow growing and allowed to grow to full maturity, fed on a natural, cereal-based diet without the need for antibiotics or artificial growth promoters. The turkeys arrive on the farm as day-old chicks from a local hatchery, the only transport of their lives! They are housed in specialist “brooding” sheds for the first 5 weeks where they are kept at 30 degrees to start with as they have no feathers to keep them warm. As the feathers grow and they start to “harden” the heat is reduced until they are ready at around 5 weeks old to be moved into the Pole barns. Turkeys are naturally inquisitive and love to explore their surroundings, making the most of fallen apples in the orchard and playing in dust baths they create under the old oak tree. We believe that our turkeys taste so good because they enjoy a life so similar to that of their wild cousins of the North American forests! At night they are tucked up in the safety of spacious Pole barns, on deep straw beds, away from the elements and our friend Mr Fox, with a clean and constant supply of food and water. As Christmas approaches, the turkeys have a short walk of no more than 100 metres to our hygiene inspected, on site, processing facility. Compare this to supermarket turkeys which are loaded onto lorries and transported through the night – sometimes hundreds of miles – to massive factories. We believe that keeping our turkeys calm and free from stress contributes to the flavor and tenderness that Cottage Farm Turkeys are renowned for!!! Our turkeys are hand plucked the old fashioned way, and game hung in a temperature controlled chiller for ten days to let the meat mature. After hanging, they are eviscerated, with the giblets packed separately for making the best gravy. Each bird is then trussed and weighed before being wrapped in grease proof paper and placed in individual boxes with a pop up timer, cooking instructions and recipe ideas for leftovers!